This is my 500th post, and I know that many of you in the 'blogging world' have achieved a lot more posts than this, but it is a milestone for me, and I aim to continue to annoy you on a regular basis! More pop-a-bobbin shuttles will be on sale in Jane's Etsy shop tomorrow afternoon, so if you would like to buy one I suggest you go over there without delay. In the meantime can you tell me how many different woods are in this shuttle display and what year was it they started to be made? 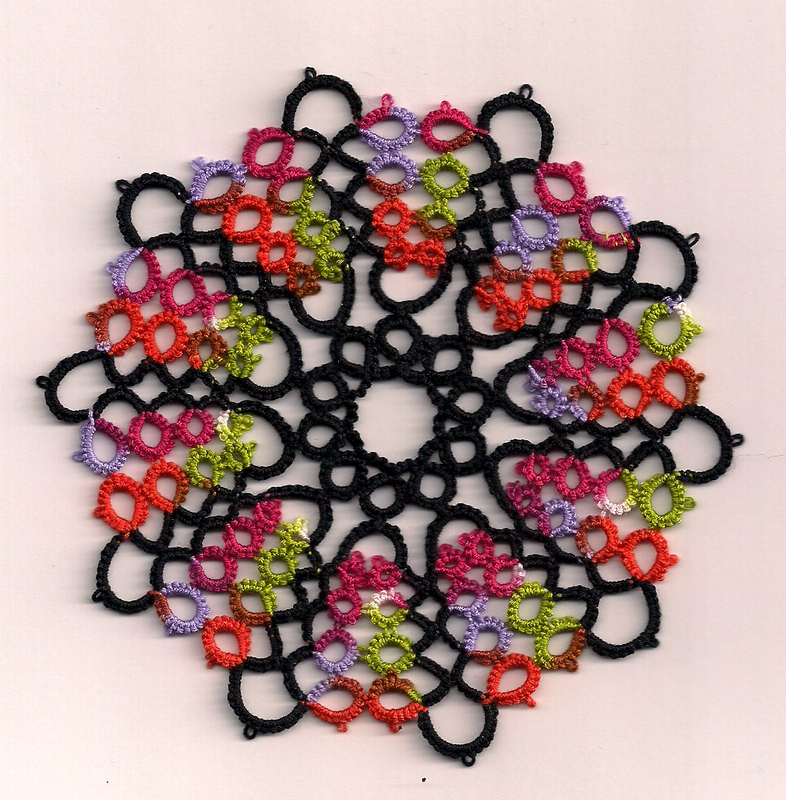 I was fortunate to buy one of Pam Palmer's books from e.bay a few years ago, this one is called Tatting Treats, however the only pattern I have tried so for is Kaleidoscope. It rather reminds me of a stained glass window. I have a few plans for this motif and hope it works out. My next blog post with be the 500th one and I have just had a quick look back over the years, it is amazing how much tatting I've done over that time. Thank you to all of you who have journeyed with me since then. Okay so it is Valentine's Day and what a perfect time to show you this poor heart that has spent over four years of it's life uncompleted hidden in the bag below. I dragged it out last week just as I came down with a cold to end or colds. So after a couple of days to recover, I picked up this ancient piece of tatting again and It is now finished! 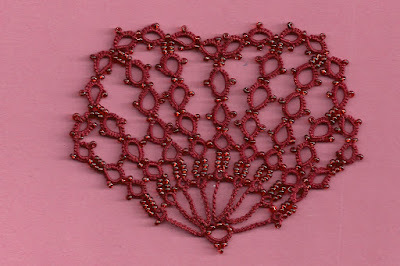 The pattern is one of Martha Ess's and it was in her class at Tat Days in 2012 that I started it. I can remember making a really bad start and from then on became very disinterested and disillusioned with the whole project. With the release from their prison, one shuttle has already gone missing, its obviously glad to be set free and both, when I find the other one, are going to be so useful for projects with lots of beads. The little bag is so cute too. I now feel a massive sense of accomplishment! Some more pop-a-bobbins have just been finished and are ready for their final testing. Amongst them is this little beauty which I have now claimed as my own. The wood is from a Cherry Plum tree. I rarely take one out of the batch but could not resist the markings on this shuttle. We have had a lot of frosty mornings over the past month but no snow, well one or two flakes have fallen from the sky but if you blinked you would have missed them. 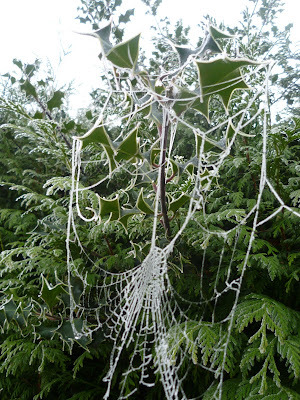 Here is a rather strange cobweb which I photographed about a week ago. It was in a hedge outside my office. It looks rather like a ghost, or may be lots of tangled tatting threads!